Kim Jones, the state director for the U.S. Department of Labor Office (USDOL) of Apprenticeship and Gerry Schuetzenhofer, chairman of the Madison-Bond Workforce Innovation Board signed the Standards of Apprenticeship agreement designating the Madison-Bond Local Workforce Development Area with the Registered Apprenticeship Program. 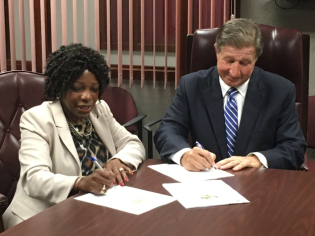 EDWARDSVILLE — Officials signed an agreement Wednesday certifying Madison County for the U.S. Department of Labor’s Registered Apprenticeship Program Intermediary/sponsor. Gerry Schuetzenhofer, chairman of the Madison-Bond Workforce Innovation Board, and Kim Jones, the state director for the U.S. Department of Labor Office (USDOL) of Apprenticeship, signed a Standards of Apprenticeship agreement designating the Madison-Bond Local Workforce Development Area with the Registered Apprenticeship Program. The agreement allows the local workforce area, which includes Madison and Bond counties, to be a part of the National Apprenticeship Program in accordance with the basic Standards of Apprenticeship established by the U.S. Secretary of Labor. “This will benefit local businesses by streamlining the process to establish apprenticeship programs,” Director of Employment and Training Tony Fuhrmann said. “We are hearing more and more about vocations being important and they’ve been taken out of high schools and many are rethinking it now,” Schuetzenhofer said. Jones agreed. She said USDOL appreciates the county coming on board in support of the apprenticeship program. 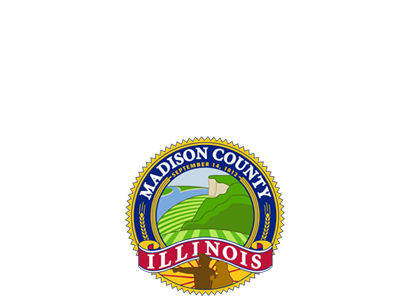 Madison-Bond local workforce is the second in Illinois to receive certification by the Department of Labor as a Registered Apprenticeship Program Intermediary/Sponsor. Fuhrmann said the county would assist local employers in hiring and training individuals to receive occupational credentials by the Department of Labor after they complete a Registered Apprenticeship Program. He said successful apprenticeship programs work best when designed by employers around their own needs. “The plan reduces red tape and requirements for administering apprenticeship programs,” Fuhrmann said. Fuhrmann said the county would be now be able to complete all the required steps with businesses instead of them needing to work with the Department of Labor. He commended Sarah Ray Lorio, Work-based Coordinator, for taking on the project from start to finish in order for the county to receive certification. “My staff looks forward to the opportunities this designation can provide to businesses and helping provide a trained workforce for their needs,” he said. There are five core components in a Registered Apprenticeship Program — classroom training, on the job training, work mentorship, progressive wages, and national occupational credentialing. The Standards negotiated between the USDOL and the Grants Department use a competency-based model that allows expedited advancement based on demonstrated performance rather than a minimum timeframe spent in training. Companies that hire eligible workers are eligible to receive partial reimbursement of wages for up to six months during the training period. What is an apprenticeship and what is a registered apprenticeship? USDOL defines an apprenticeship as an arrangement that includes a paid-work component and an educational or instructional component where an individual obtains workplace-relevant knowledge and skills. Registered apprenticeships are high-quality, work-based learning, and post-secondary “earn-and-learn” models that meet national standards for registration with the USDOL. What’s in it for job-seekers? A registered apprenticeship program is a great way for job-seekers to start a new career. Here are some great reasons to do an apprenticeship. What’s in it for participating businesses? Helps recruit and develop a highly skilled workforce.